End stage arthritis of the first metatarsophalangeal joint (MTPJ) is a forefoot complaint experienced not only in elderly but also increasingly observed in young and healthy patients. The most effective cure is an arthrodesis of the joint. Arthroscopic fusion of the first metatarsophalangeal joint is rarely described. We here present a short description of an arthroscopic MTPJ fusion technique that is easy to use; providing effective intraoperative surgery and rapid recovery. There are different grades of osteoarthritis of the first metatarsophalangeal joint (MTPJ1). It commonly starts with a partial lesion of the cartilage, osteochondritis. Extirpation of the free bodies may be sufficient for symptom treatment of partial lesions. In more severe cases where the majority of the cartilage is destroyed causing intense pain and malfunction (hallux rigidus) arthrodesis is the ultimate treatment . Partial resection and different prosthesis have been tested. The long-term outcome is however not optimal and classical arthrodesis, joint fusion is far more effective. Arthroscopic surgery of the MTPJ1 is a time-honored treatment. Van Dijk et al described in 1989 the successful use of arthroscopic approach for surgery of the metatarsophalangeal first joint . Since then arthroscopy of the MTPJ1 has been advocated for synovitis, loose bodies, and early-grade hallux rigidus [3, 4]. The arthroscopic arthrodesis can be performed with a foot block, regional or general anesthesia. A foot block provides not only adequate perioperative but long lasting up to 20 hours postoperative analgesia. The use of 20 ml ropivacain for block provides effective surgical anesthesia within 10 to 15 minutes and long lasting postoperative analgesia. The patient is placed supine on the operating table with the leg in abutment to help fixate the leg and the foot is further resting on the table. There is no need for a tourniquet. A 1.9mm size arthroscope with a 30-degree optic is used. The fluid pressure is set at 30 mmHg and an arthroscopic shaver size 2.0 mm is used for removing synovitis. Cartilage from both surfaces of the joint are removed with burr. Before starting the procedure, 5 ml lidocaine 1 mg/ml is injected into the joint for expansion and further local analgesia. The extensor tendon should be identified and marked before starting the surgery in order to avoid harm. Two ports are used, one medial and one lateral to the extensor halluces longus tendon. The optic is introduced from one side of the tendon and on the other side of the tendon the working port is introduced. Figure 1 Postoperative exterior at 4 weeks. Figure 2 Radiograph at postoperative week 4. The shaver is introduced and the synovia is removed by firm shaving under continuous observation. The cartilage is drilled away from both joint surfaces with a burr. When the joint surface is reassuringly clean from synovia and the cartilage is fused by two cross-fixed 3 mm screws. The positions of the screws are verified by a plane radiograph image. A 5 to 10 degree dorsal angulation is recommended for the arthrodesis in females and a neutral position in males. Sterile strips close the ports. 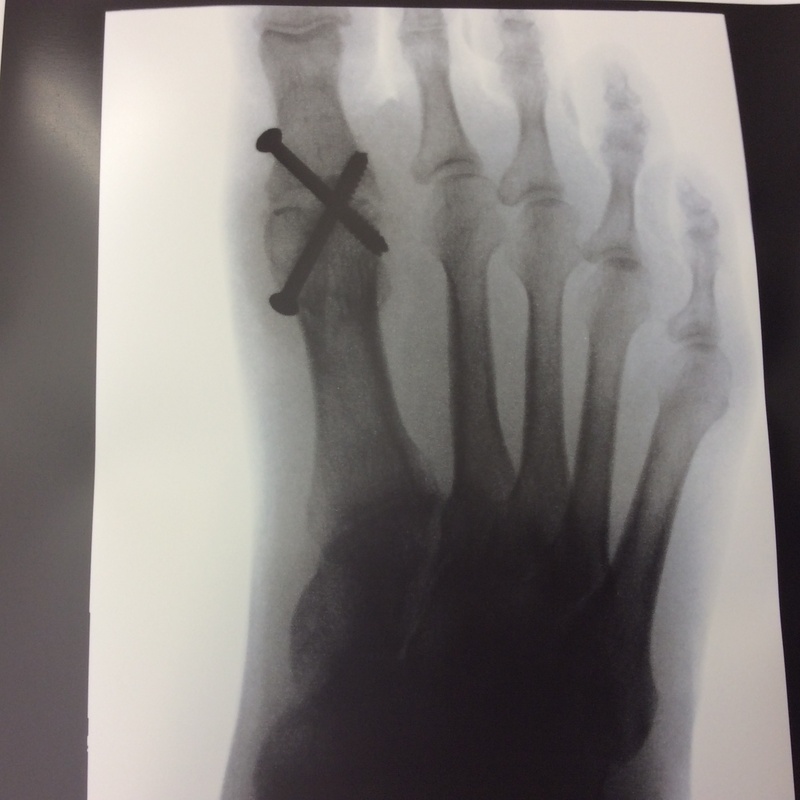 Patients are instructed to walk unloading the toe, putting weight on the later part of the foot for 3 weeks. Full weight bearing is allowed after 3 weeks. Pain is commonly mild and can be managed by ordinary over the counter painkillers, combination of acetaminophen and a NSAID. Osteoarthritis in the MTPJ1 has become more common possibly because of more physical activity, aerobics, running, etc. Osteoarthritis was in the past most commonly seen in elderly male patients. Nowadays, we see more or less equal numbers of males and females. Also, the age profile has changed from elderly to mid aged not uncommonly active patients. We believe that the change in patient profile is associated to the increase in various physical activities providing rather extensive load on the forefoot, soccer, long distance running not uncommon on hard surfaces. A joint arthrodesis provides benefits, patients become pain free, may continue to do sports, use the foot “as usual”. The arthrodesis seems an effective and long lasting approach and may be a preferred option as compared to implantation of a prosthesis . The area of the MTPJ is small and thus the forces are huge per scare cm. There is risk for further joint injury by placing a foreign material prosthesis in this metatarsophalageal joint. We strongly recommend arthrodesis with an arthroscopic technique. The minimal invasive surgery provides less surgical trauma and speeds up the recovery and rehabilitation. Turan I, Lindgren U: Compression screws arthrodesis of the first metatarsophalangeal joint. Clin. Orthop Rel Res.1987; 221:292-5.
van Dijk CN, Veenstra KM, Nuesch BC. Arthroscopic surgery of the metatarsophalangeal first joint. Arthroscopy. 1998; 14: 851-5. Siclari A, Piras M. Hallux metatarsophalangeal arthroscopy: indications and techniques. Foot Ankle Clin. 2015; 20:109-22. Hunt KJ. Hallux metatarsophalangeal (MTP) joint arthroscopy for hallux rigidus. Foot Ankle Int. 2015; 36:113-9. Ferguson CM, Ellington JK. Operative Technique: Interposition Arthroplasty and Biological Augmentation of Hallux Rigidus Surgery. Foot Ankle Clin. 2015; 20: 513-24. Schmid T, A first metatarsophalangeal joint degeneration: Arthroscopic treatment. Foot Ankle Clin. 2015; 20(3):413-420.